(Soldiers are) dumb, stupid animals to be used as pawns for foreign policy. WASHINGTON (CNN) — America’s top commander in Afghanistan warns that more troops are needed there within the next year or the nearly 8-year-old war “will likely result in failure,” according to a copy of a 66-page document obtained by The Washington Post. “Failure to gain the initiative and reverse insurgent momentum in the near-term (next 12 months) — while Afghan security capacity matures — risks an outcome where defeating the insurgency is no longer possible,” U.S. and NATO commander Gen. Stanley McChrystal said in the declassified document, according to the Post. Bob Woodward of the Post — who wrote about the leaked 66-page document — will appear on CNN’s “American Morning” on Monday. The document was “leaked” to the newspaper, but parts were omitted after consultations between the newspaper and the Department of Defense, Pentagon spokesman Geoff Morrell said. “While we would have much preferred none of this be made public at this time, we appreciate the paper’s willingness to edit out those passages, which would likely have endangered personnel and operations in Afghanistan,” Morrell said in a statement. 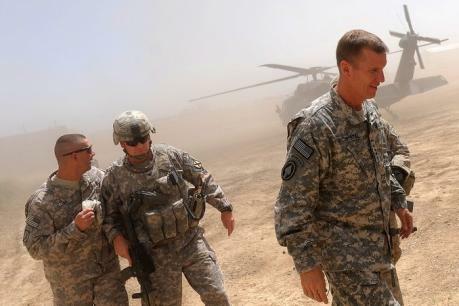 President Obama is considering the assessment of troop levels completed by McChrystal over the summer, however, a review of U.S. strategy in Afghanistan won’t be driven “by the politics of the moment,” Obama said on Sunday. The United States now has about 62,000 U.S. troops in Afghanistan, with NATO and other allies contributing about 35,000 more. The Pentagon is planning to add 6,000 troops by year’s end, and some members of Congress say McChrystal soon will call for thousands more. The fighting has ramped up sharply in the past year as U.S. troops and a NATO-dominated coalition battle a resurgence of the Taliban, the al Qaeda-allied Islamic militia that ruled most of Afghanistan before the attacks. Washington poured an additional 21,000 troops into Afghanistan to provide security for its recent presidential election, which has been marred by allegations of fraud. In August, 48 U.S. troops were killed in the fighting, surpassing the previous high of 45 in July. And the war has spread into Pakistan, where Taliban fighters are now battling government troops in that nuclear-armed country. But support for the Afghan war hit an all-time low in a CNN/Opinion Research Corp. poll released last week. That survey found 39 percent still favor the war, compared with 58 percent who oppose it — making it almost as unpopular as the Iraq war has become in recent years. And calls for more troops could be a tough sell in Congress. “If we can get the Afghan army much larger, much better equipped, and if we can also get a plan, finally, for co-opting or reintegrating those lower-level Taliban people the way we did in Iraq — if we can get that in motion — that hopefully will have an effect on how many additional troops we need to go to Afghanistan,” Levin told CNN on Sunday. Leading Republicans have called for McChrystal and Gen. David Petraeus, the U.S. commander in the Middle East and Central Asia, to testify publicly about their recommendations. Senate Minority Leader Mitch McConnell, R-Kentucky, told CNN that it was time for lawmakers to hear what McChrystal has to say. Sen. Lindsey Graham, another Republican on the Armed Services Committee, said a decision on additional troops needs to be made soon. “I’ve been told Gen. McChrystal’s ready to hit the send button in terms of how many more troops he needs, and the longer we wait the harder it is,” said Graham, of South Carolina.